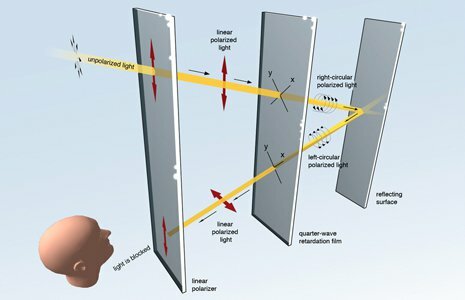 It hits the linear polariser, this vertically polarises the light. (Polarising means – roughly – aligning the wave vibration in a particular direction). So why doesn't the light from your phone’s display get blocked? Because it only goes through the second half of this journey so the light is unpolarised when it hits the final filter and goes through. 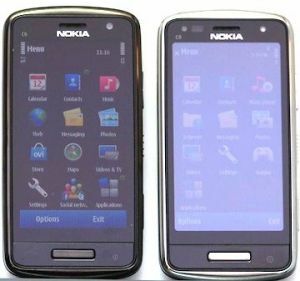 Nokia has announced several AMOLED phones that has CBD displays: the E7 and the C6-01, the X7, the N9 and the Lumia 710, Lumia 800 and Lumia 900. 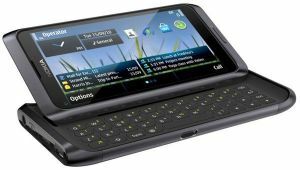 All CBD displays except the one in the Lumia 710 are AMOLED ones. Engadget really likes the CBD displays: "The screen is simply gorgeous -- ClearBlack may be a gimmicky trademark, but CBD's black levels are no joke. We're definitely talking Super AMOLED degrees of awesome...". Engadget also puts it to the test against Apple's S-LCD retina-display. They say that the iPhone's display has a "noticeable blue warmth" and wasn't as vibrant or bright as the AMOLED, which was a bit oversaturated. 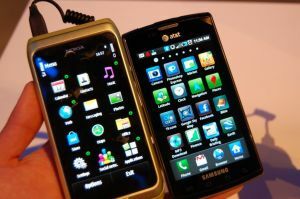 In the photo above, you can see the Nokia's E7 (left) vs a Galaxy S with a Super-AMOLED.